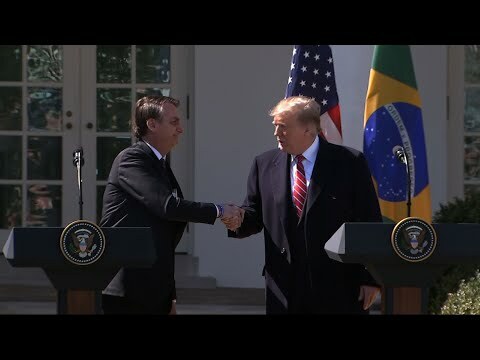 WASHINGTON (AP) — President Donald Trump welcomed Brazil’s new far-right leader to the White House Tuesday and made clear that flattery pays. Brazilian President Jair Bolsonaro — the “Trump of the Tropics”— ran an unabashedly pro-Trump, pro-American campaign last year, emulating Trump in tone and style. It seems to have paid off for Bolsonaro on his first official trip to Washington. At a joint news conference, Trump announced that he’d agreed to designate Brazil a “major non-NATO ally” — something Brazil had pursued to smooth U.S. weapons purchases and military coordination. Trump even said he’d be open to granting full NATO membership to Latin America’s largest and most populous nation, even though Brazil doesn’t quality to join the North Atlantic alliance. The showing was the latest example of the premium Trump puts on personal relationships and the extent to which he’s willing to work with those who sing his virtues. And it renewed focus on the growing wave of populist strongmen who have captured voters’ support with blunt admonitions of “political correctness” and hardline immigration views. As they sat down for the first time, Trump hailed Bolsonaro’s run as “one of the incredible campaigns,” saying he was “honored” it had drawn comparisons to his own 2016 victory. And he predicted the two would have a “fantastic working relationship,” telling reporters at a joint press conference that they have “many views” in common. The two also exchanged soccer jerseys in a sign of their budding friendship. Bolsonaro was equally complimentary, predicting Trump would win re-election in 2020 and drawing parallels between their efforts. The embrace represents a shift in U.S.-Brazilian relations. In 2013, leaks from Edward Snowden revealed that the National Security Agency had wiretapped conversations of former President Dilma Rousseff, leading to several years of tense relations between the nations. Bolsonaro had arrived in the U.S. with a half a dozen ministers and a goal of expanding trade, diplomatic and military cooperation between the two largest economies in the Western Hemisphere. And Trump appeared eager to deliver. He announced he would back Brazil’s effort’s to join the Organisation for Economic Co-operation and Development, while floating the idea of full NATO membership, though he said he’d “have to talk to a lot of people” for Brazil to join the organization. However, James Stavridis, a retired Navy admiral who was the Supreme Allied Commander at NATO from 2009 to 2013, said Brazil does not qualify for full membership under the North Atlantic Treaty of 1949. The efforts came as both countries continue to denounce the crisis in Venezuela and called on members of the Venezuelan military to end their support for President Nicolas Maduro. Both the U.S. and Brazil have recognized opposition leader Juan Guaido as Venezuela’s legitimate leader, and Trump reiterated that “all options” to address Venezuela’s economic and political crisis remain on the table. The leaders also were expected to discuss a range of other issues, including expanding trade relations and increasing U.S. private-sector investment in Brazil. Bolsonaro also had the support of Trump’s former chief strategist Steve Bannon, who has since parted ways with the White House. While Bolsonaro has dismissed reports that Bannon played a key role in his campaign, Bolsonaro’s son Eduardo approached Bannon in July of last year and the two struck up a friendship. In August, Eduardo posted a picture of the two of them on Instagram with a caption that said Bannon was an “enthusiast” of his father’s candidacy and that they would “unite forces against cultural Marxism.” It was one of several meetings, Bannon said. On Sunday, Bannon joined Bolsonaro for a dinner at the Brazilian Embassy along with various Cabinet members and other leaders, where they discussed subjects including the country’s economic plans. Bolsonaro, Bannon told The Associated Press, “understands the Trump program and understands President Trump” and said both represent a “tectonic plate shift in the world of politics” toward blunt, politically incorrect leaders in the model of Trump. “This is a new kind of global political moment,” he said.